Distills the essence of a wide range of therapies into a creative synthesis, opening up a new way of understanding each person's confrontation with four ultimate concerns: isolation, meaninglessness, death, and freedom. Existential therapy has been practiced and continues to be practiced in many forms and situations throughout the world. But until now, it has lacked a coherent structure, and analysis of its tenets, and an evaluation of its usefulness. Irvin Yalom, whose Theory and Practice of Group Psychotherapy has rendered such a service to that discipline since 1970, provides existential psychotherapy with a background, a synthesis, and a framework.Organized around what Yalom identifies as the four ultimate concerns of life",death, freedom, existential isolation, and meaninglessness,the book takes up the meaning of each existential concern and the type of conflict that springs from our confrontation with each. 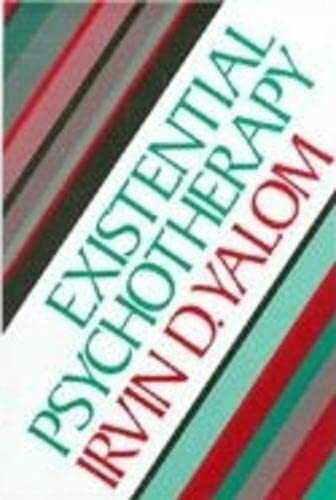 He shows how these concerns are manifested in personality and psychopathology, and how treatment can be helped by our knowledge of them.Drawing from clinical experience, empirical research, philosophy, and great literature, Yalom has written a broad and comprehensive book. It will provide an intellectual home base for those psychotherapists who have sensed the incompatability of orthodox theories with their own clinical experience, and it opens new doors for empirical research. The fundamental concerns of therapy and the central issues of human existence are woven together here as never before, with intellectual and clinical results that will surprise and enlighten all readers.